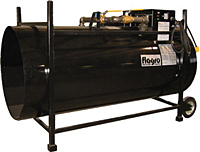 Construction Heater Rental – Dual Fuel – F-1500T by Flagro will provide your professional crew with powerful heat on your construction site and during maintenance projects. Value pricing, fast delivery, accurate price quotes & highly rated customer service from an Upstate New York’s heater rental leader – the Duke Company. The F-1500T Heater Rental by Flagro provides powerful temporary heat for a range of construction and maintenance applications and is equipped with extensive safeguard systems. Inlet Pressure Natural Gas: 9 W.C. The Duke Company offers the fastest heater rental delivery through-out Upstate New York including: Brighton NY, Canandaigua NY, Dryden NY, Irondequoit NY and Perinton NY.